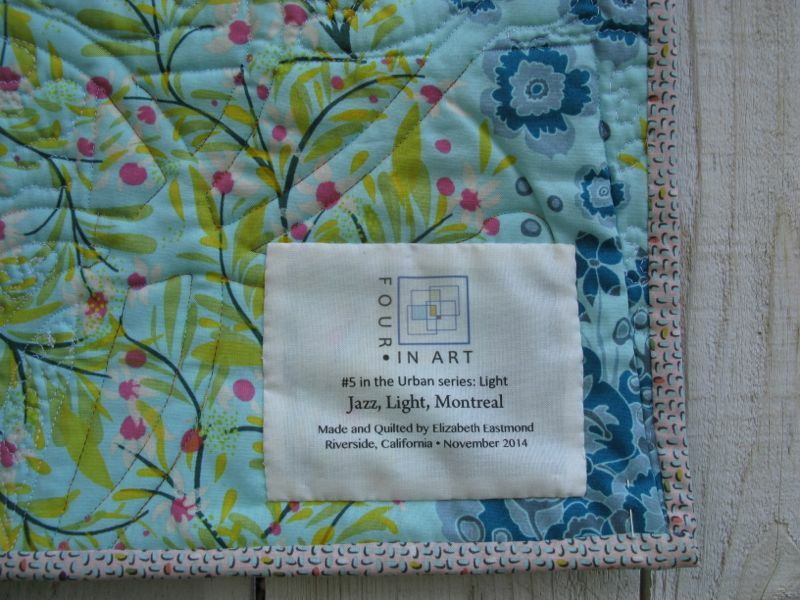 Jazz, Light, Montreal, a Four-in-Art Quilt, November 2014 | OccasionalPiece--Quilt! Posted on November 1, 2014 by Elizabeth E.
When the challenge theme was announced, of Light, I started looking and noticing urban light–both that which sheds or projects the light, and that which receives the light. Multi-hued lights intrigued me, as well as light fixtures (as you saw before). I was also interested in reflections of city lights on windows and in rain puddles. 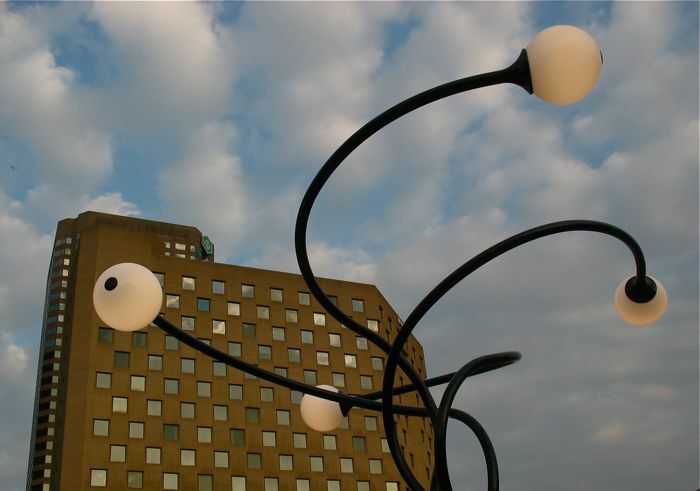 But in the end, I went with a memory–the graceful arching lights of Montreal, swirling over the Jazz Festival that was in its final days. Yet the artistry in that photograph comes partly because of the different widths of the light poles, changing from thicker to more slender as they were sited in the field of view. I fiddled and widgeted my stuff, moving and trying to get that look but with my bias tape, I could not really manipulate the widths easily, although I tried. So mine resembles a spider the day AFTER Halloween, squished beyond recognition. How appropriate that today’s reveal date is November 1st. Since this little foray into representation is not one of my favorite art quilts I’m not going to do a deconstruction post. I tried out multiple brown fabrics and thought about trying to mimic the interesting placement of windows as shown in the photo above, but in the end, went with one that conveyed the pane-pierced facade. Okay, maybe not so much, but I gave it a try. I fused it on, satin-stitched around it. 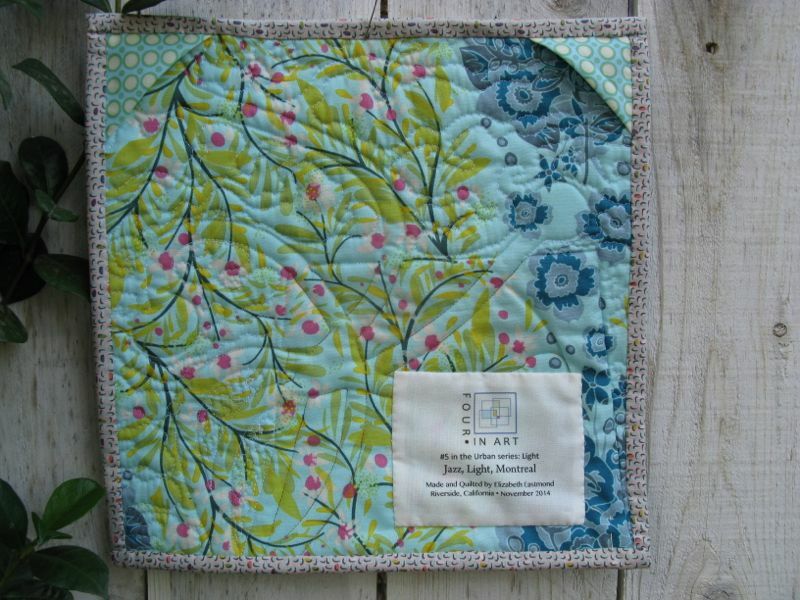 Sewed down the light posts, then used a zig-zag stitch to quilt clouds into the sky. In fact, the more I write about this, the more I realize that not every art quilt will challenge me to learn a new technique, which is what I want to do. 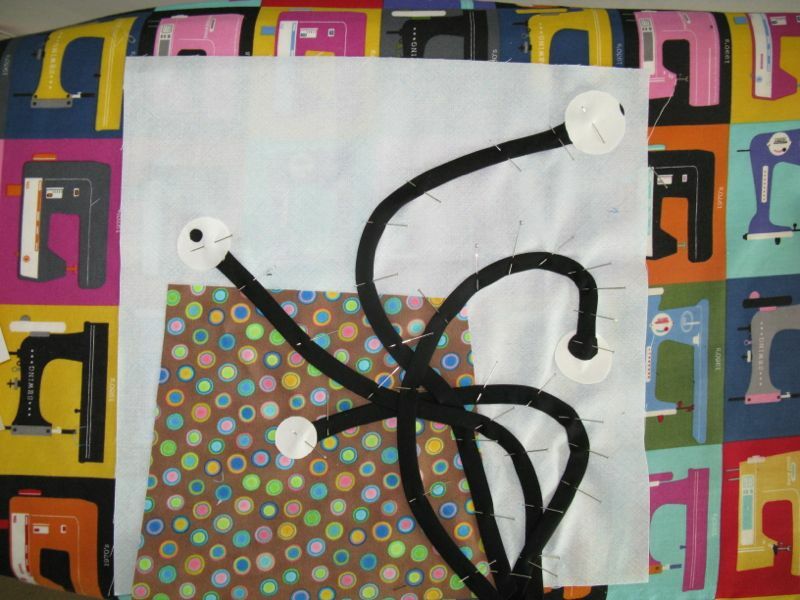 Sometimes you come to the project tired and worn out and your brain cells look more and more like the spotted building in my art quilt, or perhaps that splayed spider thingie and pulling out the stops means Getting It Done and Moving On. I do like the back quite well. No complaint about that Anna Maria Horner fabric from eons ago. And ever since Betty started putting labels on hers, I’ve copied her example and now have a lovely collection of art quilts, properly provenanced. The quilt is 12″ square, and I used a fancy little bit for the binding (hoping it would redeem the front?). 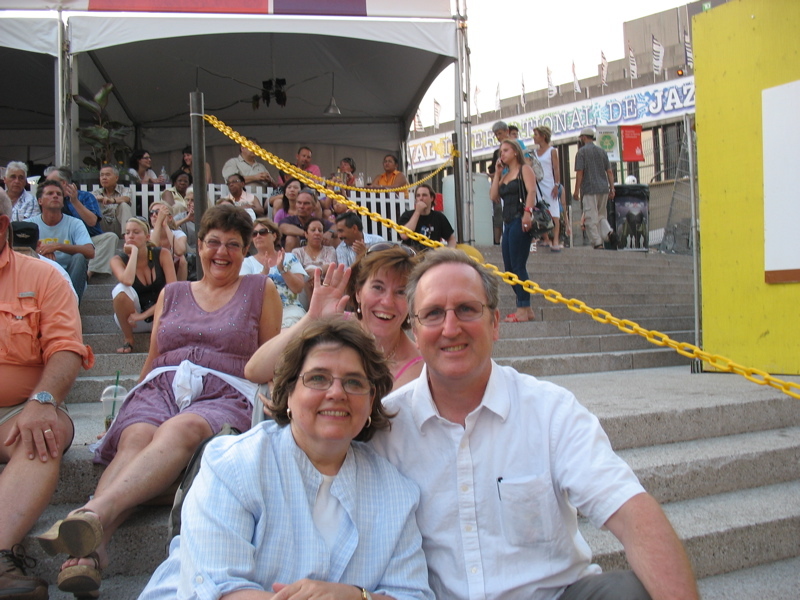 But the best thing is the memory of that horribly hot night, sitting on the steps listening to jazz, getting photo-bombed by a tourist behind me who turned out to be a quilter, and we spent a long time showing each other quilt photos from our phones. I look somewhat different now, but it was a great night watching people bee-bop to the doo-wap (try and find them! ), sitting under that graceful swirling street light. Normally we only have four challenges a year (hence, the name: Four-in-Art), but this year we decided to jive up to the calendar year, and so added in this last challenge, making it a #5. In the next cycle we’ll be back to four, and we’re trying something different. Our overall theme will be Literature, but each quilter will think up her own quarterly challenge, instead of having a group challenge. We’ll still reveal on the first days of February, May, August and November. We have also had some subtractions and additions in the last few weeks, so won’t have a full compliment of eight quilters until next February. 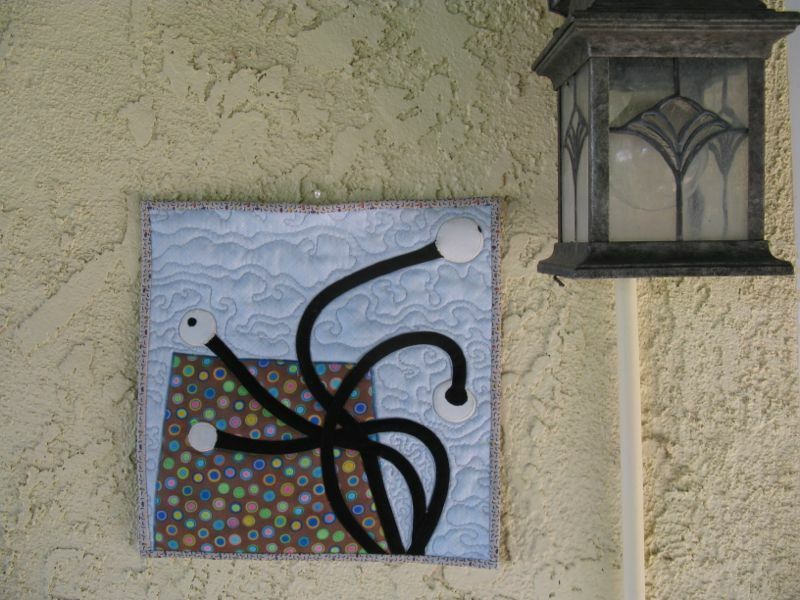 Come see what other quilters in our Four-in-Art Group have done! and please head *here* to vote for Anne’s Cascade quilt, a finalist in the Craftsy Pattern Design Awards!! Coming in a couple of days. . . I absolutely love this little thing and even if it’s not one of YOUR favs, it’s certainly mine! Everything about it is perfect in representation – the Kaffe fabric for the building and the quilting which comes off as heat from the lights. It’s purely coincidental that it looks spidery on the day after Halloween. My reveal this go-round is totally abstract and that in itself is “learning a new technique” for me! Great job. Sometimes just the “completion” is the ‘success’ and the ‘learning’ comes in a wee different form. Your thought processes/eval. certainly shows your insights (after the fact) into this one’s construction (not to be repeated?? or approached somewhat differently next time?). Maybe the idea of liking it, or not, is irrelevant? 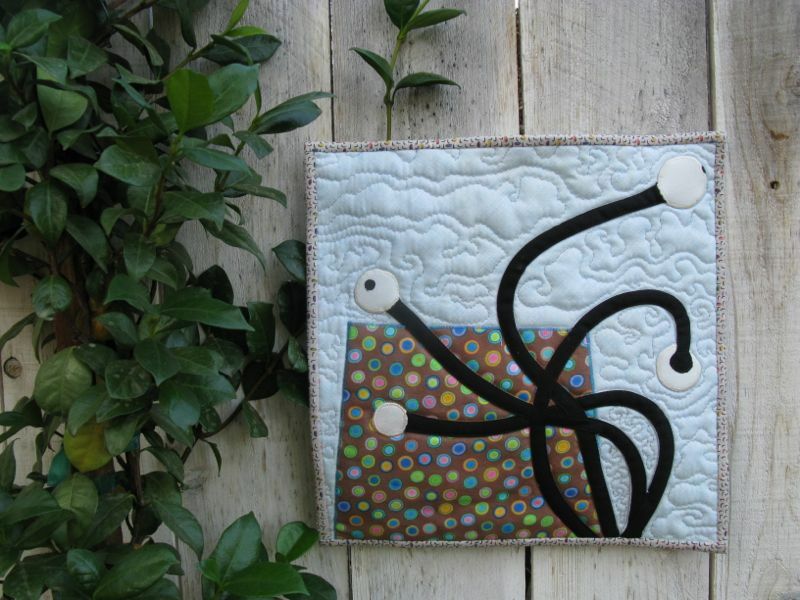 I especially love the quilting that mimics the shape and motion of the clouds. I think you totally captured the essence of your photograph with this little quilt. The fabric choice for the building is perfect and I really like your light fixture. I also tend to get caught up in trying to create an accurate representation of something, so step back, look at it again in a few weeks and you might feel differently. This image was a favorite from the previous light photos you shared awhile back. I think you’re being too hard on yourself but when you don’t “feel” it, it is hard to finish. It’s still a fun little quilt and I happen to like it even if it’s not your favorite. The shapes are just so playful and the use of the dotted fabric adds to the playfulness. I actually did finish up my last quilt even though I was really tempted to get off the hook on this one since I won’t be continuing and it turned out to be one of my favs. Perhaps you learnt not to push an idea when it doesn’t want to happen or that learning happens at its own pace? Whatever the lesson, I like this little quilt for its simplicity and the memories it evokes for you! I think Anne got it right- its a quilt full of fun! I really like this quilt! It really does look like the happy snap taken at the festival. Great job Elizabeth!! Elizabeth, I am glad you chose this photograph to interpret in your art quilt. “….But in the end, I went with a memory” really spoke to me. I love how the photobomber in your picture turned out to be a fellow quilter! Another reason why we should all have quilt pictures on our phones ;-)) You never know…. I’ll join the chorus of people who like the quilt more than you do. it helps not to have the idea in your head for us to compare it to–we don’t see where it is wanting. The brown fabric gives the feel of a building with lighted windows even though they are not squares. In fact the circle dots echoing the light bulbs is a very good move. A friend of mine has a floor lamp with adjustable bulbs and I always think “hydra” when I see it. Your quilt reminds me of her lamp as well as suggesting the light in Montreal. Again, a piece well done. I like that you focused on one type of light. The interpretation of the building in the background grounds the black bias “poles” of the lights. Quilting on the blue tells us it is sky. How clever you are, Elizabeth! It’s a great little quilt. I look forward to seeing what you come up with in 2015. Thanks for letting me participate and stretch myself like I did even though it ended up not being “my thing”! This quilt totally blew my mind. It’s just amazing. (I’m doing a lousy job of not just saying “nice quilt.”) Really it’s a great piece of art and you perfectly captured your photo in quilt form.